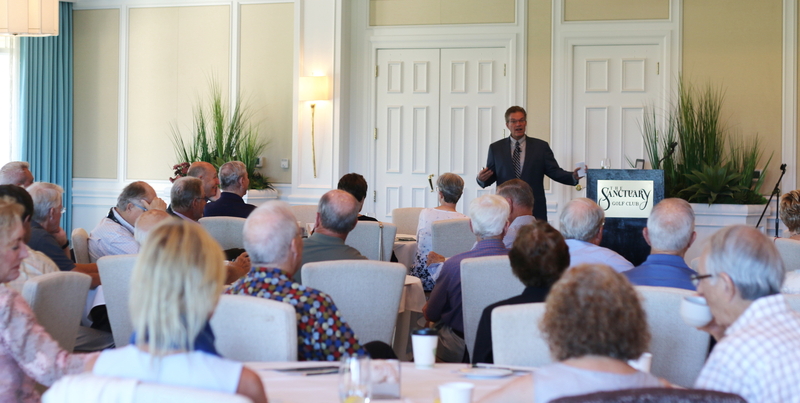 The Sanibel Captiva Trust Company launched their first program of the season this week with an important topic on why to incorporate a corporate trustee into your estate plan. Over 60 guests attended the event at The Sanctuary Golf Club and were welcomed by Al Hanser, Founder and Chairman of The Trust Company. Hanser commented on the growth of the firm, starting from simple beginnings and now with $1.7 billion in assets under management, they have incorporated several key employees necessary to continue the high level of sophistication presented by their seasoned and valued clientele. “One of those individuals is David Port, our in-house attorney who reviews our clients’ trusts and estate plans, to assure the documents are executed according to their wishes and to the benefit of their heirs,” said Hanser. David F. Port, J.D. presented on “The Gift of Confidence – Why to Consider a Corporate Trustee.” Port spoke primarily on both corporate trustees and corporate co-trustees, who work in tandem usually with a family member. Port highlighted what constitutes a trust agreement, the duties and responsibilities of a trustee and perhaps, most importantly, how to choose a trustee. “Selecting a trustee of your estate is not considered an honor, but a responsibility” he explained. “It’s almost a full time job and requires that individual to be knowledgeable about trust administration, accounting, taxes, filing and beneficiary reporting matters. The individual also needs to have personal knowledge about family situations and be able to display a strong demeanor when making decisions about the distribution of the funds from the trust, while remaining objective and impartial.” Port emphasizes that this responsibility is no easy task and that the role requires a commitment for at least one full generation. Photo: David F. Port, J.D., Fiduciary Services at The Trust Company presents to a full house at the firm’s first event of the season.